… then you need to be sure you’re acting on the most up to date and professional guidance available. 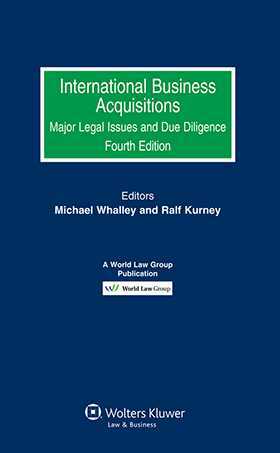 Now in its fourth edition, the internationally acclaimed International Business Acquisitions provides you with a clear guide to the major legal issues and the process of informed due diligence in each jurisdiction. This user-friendly work acts as an easily accessed desk reference for lawyers, business executives and others concerned with the acquisition of the securities or business assets of a company located outside their own national jurisdiction. It is also directly relevant if you are representing the sellers in such transactions, as you will need to anticipate and prepare for the foreign buyer’s requirements and concerns. Despite significant harmonization within the EU, the legal practices, requirements and pitfalls relevant to cross border transactions tend to be different in every country. However, increasingly common standards and documentation are now being introduced. The essential country-by-country presentations described here will help to guide you through the differences. To help you compare them as easily as possible, the author presents each country contribution in a common format. As in previous editions, the subject of due diligence is treated in a separate chapter, with individual country annotations. International Business Acquisitions is the result of a co-operative effort by member firms of the World Law Group, an alliance of 50+ leading independent firms with more than 15,000 lawyers working in 65 countries and in more than 300 international business centres. You can therefore be confident that the advice and coverage within this book will help you in all aspects of your work with international acquisitions. Editors’ Preface to the First Edition. Editors’ Preface to the Fourth Edition. CHAPTER 2 Major Legal Issues. 1. Argentina Carlos Alfaro & Sebastian Rodrigo, Alfaro-Abogados. 2. Australia Michael Whalley, Gordon Williams & Peter Capodistrias, Minter Ellison. 3. Austria Peter Huber, CMS Reich-Rohrwig Hainz. 4. Belgium Cedric Guyot & Olivia de Patoul, CMS DeBacker. 5. Brazil José Luis de Salles Freire, Tozzini, Freire, Teixeira e Silva Advogados. 6. Canada Robert S. Vineberg, Davies Ward Phillips & Vineberg LLP. 7. Chile Sergio Orrego F., Urenda, Rencoret, Orrego y Dörr Abogados . 8. China Susan Ning & Jianwen Huang, King & Wood Mallesons. 9. Costa Rica Pedro Muñoz, Sophia Murillo Lopez, Rocío Pérez, Ana Karina Jiménez, Carolina Flores, Carlos Ubico, Andrey Dorado, Carlos Camacho, Roy Herrera, Daniel Araya, José Francisco Vega, Carmen Castro, Eduardo Zuñiga, Vinicio Lerici, Alejandra Castro, Andrea Flores Fallas, Esteban Paniagua, Arias & Muñoz. 10. Denmark Jens Christian Hesse Rasmussen & Anders Rubinstein, Bech-Bruun Law Firm. 11. England and Wales Stuart Young, Wragge & Co LLP. 12. Finland Jan Örndahl, Castrén & Snellman Attorneys Ltd .
13. France Jean-Luc Soulier & Chems Idrissi, Soulier. 14. Germany Ralf Kurney, CMS Hasche Sigle. 15. Hong Kong Geraldine Johns-Putra & Phoebe Roberts, Minter Ellison . 16. India Satwinder Singh, Hitesh Sablok & Piyush Bhawalpuria, Vaish Associates Advocates. 17. Indonesia Anita Lubis, Lina Amran & Richard Cornwallis, Makarim & Taira S.
18. Ireland David O’Donnell & Liam Brazil, Mason Hayes & Curran. 19. Israel Janet Pahima & Nick Cannon, Herzog Fox & Neeman. 20. Italy Francesco Gianni - Gianni, Origoni, Grippo, Cappelli & Partners . 21. Japan Tsuneo Sato, City-Yuwa Partners. 22. Malaysia Swee-Kee Ng & Marhaini Nordin, Shearn Delamore & Co .
23. Mexico Jorge A. León-Orantes B., Santamarina y Steta S. C.
24. The Netherlands Martika Jonk & Jacqueline Feld, CMS Derks Star Busmann N.V.
25. Norway Jakob Villum, Advokatfirmaet Schjødt AS. 26. Peru José Antonio Payet & Susan Castillo, Payet Rey, Cauvi, Pérez, Mur . 27. The Philippines Mia G. Gentugaya, Joanna Pauline C. Pimentel & Vera Marie H. Bautista, SyCip Salazar Hernandez & Gatmaitan. 28. Poland Tomasz Kanski, Sołtysin´ski Kawecki & Szlezak. 29. Portugal Manuel Santos Vitor, PLMJ – Sociedade de Advogados, RL . 30. Russia David Cranfield & Kristina Kondruseva, CMS Russia. 31. Scotland Scott Kerr, McClure Naismith. 32. Singapore Gerald Singham & Terence Yeo, Rodyk & Davidson LLP. 33. South Korea Yong Suk Oh & Sun Hee Park, Bae, Kim & Lee. 34. Spain Coordinated by Raimundo Segura with the assistance of Cuatrecasas Gonçalves Pereira’s Knowledge Management Centre. 35. Sweden Åke J. Fors, in collaboration with Jamie Stanbury, Setterwalls . 36. Switzerland Max Albers-Schönberg & Daniel Jenny, CMS von Erlach Poncet. 37. Taiwan Paiff Huang, Chun-yih Cheng & Vera Chang, Formosa Transnational.